Russian Prime Minister Vladimir Putin accused the US of staging the Georgian conflict. His statements echo two articles pointing to Senator John McCain's foreign policy adviser, Randy Scheunemann, in which conservative politician Pat Buchanan calls Sheunemann " a dual loyalist, a foreign agent whose assignment is to get America committed to spilling the blood of her sons for client regimes who have made this moral mercenary a rich man." Gareth Porter also states that The US is going to use a double standard to condemn Russia." VLADIMIR PUTIN, RUSSIAN PRIME MINISTER (SUBTITLED TRANSLATION): If my guesses are proved, then it raises suspicion that someone in the United States had deliberately created this conflict with the purpose of aggravating the situation and creating an advantage for one of the candidates in the election struggle for president of the United States. NKWETA: Putin’s assertion has surfaced before, considering that Senator John McCain’s foreign policy advisor is Randy Scheunemann. Conservative politician Pat Buchanan wrote in Creative.com that "From January 2007 to March 2008, the McCain campaign paid Scheunemann $70,000… pocket change, compared to the $290,000 his Orion Strategies banked in those same 15 months from the Georgian regime of Mikhail Saakashvili." Saakashvili, Buchanan states, wanted Scheunemann to "Get Georgia a NATO war guarantee. Get America committed to fight Russia, if necessary, on behalf of Georgia." Robert Scheer of Truthdig.com also wrote that he finds it "inconceivable that Saakashvili would have triggered this dangerous escalation without some assurance from influential Americans he trusted, like Scheunemann." And "McCain gets to look tough with a new Cold War to fight while Democratic presidential candidate Barack Obama, scrambling to make sense of a more measured foreign policy posture, will seem weak in comparison. 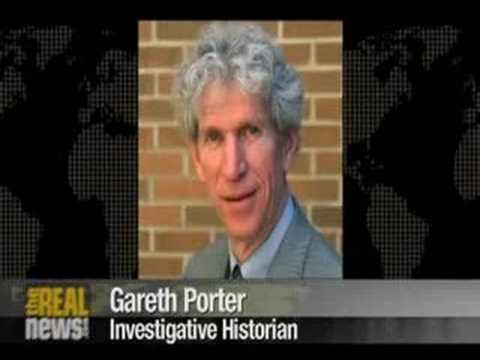 GARETH PORTER, MILITARY POLICY ANALYST AND INVESTIGATIVE HISTORIAN: The Russian recognition of the independence of South Ossetia and Abkhazia from Georgia is the most important fallout from the war that occurred earlier this month, simply because it sets in motion a set of dynamics which are obviously not going to be easily reversed and which will be in effect for a long period of time. That means that the United States and other allies of the United States which are upset with the Russian behavior over Georgia will have an issue in which they can really pound away at the Russians and use that as an issue to isolate and to punish the Russians in some symbolic way. NKWETA: Georgia’s military offensive on its rebel region of South Ossetia on August 7 met with a rapid and effective Russian military response. Earlier this week, tensions continued to mount as a US military ship docked in the southern Georgian port city of Batumi. Russia responded, sending a missile cruiser and two other ships to another Georgian port in a show of force amid an escalating standoff between Russia and the West. MILITARY OFFICIAL (SUBTITLED TRANSLATION): The Black Sea is a little bit too crowded. Each ship has reconnaissance means with a radius of operation ranging from 300 to 400 kilometers (186 to 249 miles), so the situation is not typical. NKWETA: While the ceasefire agreement calls for both sides to withdraw to their previous positions, Moscow says the agreement allows Russian forces to occupy security zones outside the rebel regions. DANA PERINO, WHITE HOUSE PRESS SECRETARY: We also are very concerned because Russia continues not to be in full compliance with the agreement that it signed onto just two weeks ago. So we’re going to continue to press. There will be consequences for Russia. PORTER: This issue of the secessionist territories between Russia and Georgia is not an issue on which the United States and other outside powers are going to make judgments that reflect a balanced, fair, objective set of criteria. They are going to, obviously, use a double-standard in order to condemn the Russians for doing what certainly the United States would have done in similar circumstances and to expect Russia to be self-denying on an issue which basically no other power would be expected to operate in that way.